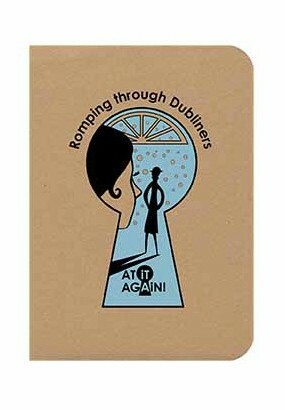 New Romping through Dubliners pocket guide by At it Again! Join us on the eve of James Joyce’s birthday to celebrate the launch of our new book, Romping through Dubliners, in The James Joyce Centre. ​Spend a fun evening with the four creative heads behind Romping through Ulysses. Our new title is based on James Joyce’s series of unfortunate events Dubliners. It’s a fun way to discover Dublin and the places that inspired one of Ireland’s most famous writers. Dip into it if you are soaking up Dubliners for the first time or even if you are at it again! It distills the stories and features maps, things to do and see, titbits and great quotes. At it Again! love bringing Irish literature to life in a fun and fresh way. We want to take you on a literary adventure, exploring Irish writers, their works and the places that inspired them. Come for a glass of wine, a giggle, and maybe even a stimulating literary discussion or two. Dubliners, Events, Irish Writers, James Joyce Books, Dubliners, Event, Irish Classics, Irish Writers, James Joyce, Launch. permalink.